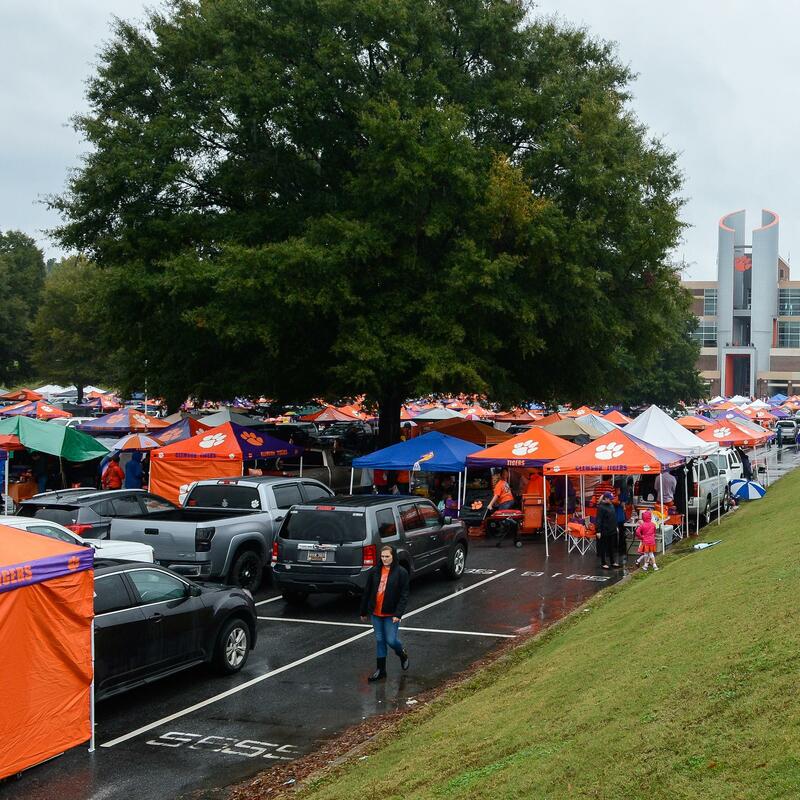 CLEMSON – After local areas received more than five inches of rain in the past five days, athletic department and IPTAY officials announced gameday parking adjustments for Saturday’s football contest against Florida State. With rains saturating grass parking areas, officials have closed Lots 1 and 2, with Lots 13 and 14 having limited capacity. Any further updates on parking will be available on ClemsonTigers.com and through the department’s social media channels @ClemsonTigers. If you have a state issued ADA placard or hangtag and your lot is closed, please use your ADA tag to park at the Hendrix Center and use the shuttle service to and from Gate 1. Closed to all vehicle parking. Patrons displaying a Lot 1 pass will be directed to park in two locations. The first 200 will be allowed entry into the lot located on Delta St. off Old Stadium Rd. Your secondary option will be the lower corner of the Walker Course Driving Range, also located off Old Stadium Road before the Delta Street lot. Closed to all vehicle parking. Patrons displaying a Lot 2 pass will be given entry to the C1 lot. This 1300 space solid surface parking lot will accommodate all those assigned a Lot 2 pass. There is a shuttle from this lot to the East Library Circle before the game. To walk to Memorial Stadium from C1, leave the lot and walk past the Hendrix Center to McMillan Road. Turn right onto the pedestrian bridge at the library and then right onto Calhoun Drive. Turn left onto Fort Hill Street and follow it to the stadium. Due to outgoing traffic patterns and volume of traffic on these roads, there is no quick and efficient shuttle route postgame. If you have an ADA placard and park in Lot 2 please use this ADA state issued pass/tag to park at the Hendrix Center and use the ADA shuttle service to and from Gate 1. The walk from Memorial Stadium to C1 is eight-tenths of a mile with the most direct route being from Howard’s Rock up Fort Hill St, right onto Calhoun Dr, left onto the pedestrian bridge at the library and then left onto McMillan Road to the Hendrix Center. C1 is just off Cherry Road across from the Hendrix Center ADA parking lot. Limited availability for parking. We anticipate being able to use roughly 600 spaces inside the fence and then another 150 spaces outside the fence and near the rowing center. Once these areas are full, cars with a Lot 13 pass will be directed to park on McGregor Road located just off Hwy 93 and Seneca Creek Road near the University Beach property. Shuttle buses will be provided in this location starting at 10 a.m. These buses will pick up at the corner of Hwy 93 and Perimeter Road postgame. Limited to the half in front of the indoor track complex. When Lot 14 is full you will be directed to park in the upper Brooks Center lot at the P&A Building located off Cherry Rd and Jersey Lane. Parking options have also been impacted by the excessive rainfall and the redirection of cars from IPTAY assigned lots. All general public parking around the Walker Golf course, Old Stadium Road and the golf maintenance area at the corner of Cherry and Perimeter Road will be closed. C1 – typically a $20/car lot will not be available to those without a Lot 2 parking pass or prepaid C1 permit on Saturday. Additionally the wet conditions have limited the available space at the University Beach as well as Kite Hill. If you typically park in these locations please consider carpooling and taking advantage of other options at local businesses, churches or at private homeowners that sell parking spaces on football gamedays.